When I started writing poetry consciously in 2002, it was not unusual to see me reading a poem by the greats – like Shakespeare, Yeats, Frost, Clark, Leopold and their contemporaries – and then writing a mirror poem. Then, I could work on a poem for days trying to master the existing styles (mostly sonnets and other metered poems). As a result, my poems were mostly with rhyme, rhythm and regular meter for years, until around 2009. A decade into poetry, I had developed my own rules. I change them as I grow. These days however, new ‘poets’ simply gather expressions, break them into verses and group them into stanzas (or just flow) – then you have a poem. There is nothing wrong in that, especially with poets whose verses are rich in metaphors, imagery and all other ingredients of poetry. But it must be also noted that following poetry rules gives our poems structure and clarity – common ground rules that help the poet communicate clearly and effectively to the reader. In this lecture, our main concern in PUNCTUATION. 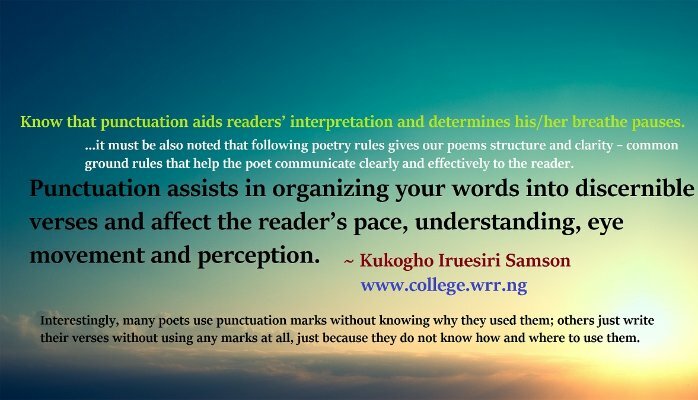 Interestingly, many poets use punctuation marks without knowing why they used them; others just write their verses without using any marks at all, not deliberately, just because they do not know how and where to use them. A third group of poets place punctuation arbitrarily, without realizing that punctuation actually aid the readers’ interpretation and also determines his/her breathe pauses. The fact is that the punctuation marks thrown in affect the reader’s pace, understanding, eye movement and perception. WHICH PUNCTUATION MARKS SHOULD A POET USE? PERIOD (.) - the period is used to show a final end to the thought/sentence and indeed verse; after an abbreviation. The reader will most likely stop to think about what has been read so far. Does it not make you cry? It is sometimes a yoke!" DASH (– /-) - the dash is of two types, endash (short) and the emdash (long/double dash). It is a heavy yoke"
QUOTATIONS MARKS ( “ ” ) - the quotation mark is used to separate the part of a verse that is directly spoken by a persona in the poem or quote attributed to another source and presented word for word. The son of man said "I am the way"
"I am the way… life"
Punctuation gives the reader a brief release in tension, allowing him/her to pause for a moment and consider what has been read so far. This is why you must be thoughtful in where you break the line because your choices will affect the reader’s experience of the flow and motion of the poem. The poem above used detailed internal punctuations but does not follow the norm of using uppercase letters as the beginning of each verse as is done by most traditional poets. In this case, the poet deliberately broke rules. CAN YOU DO WITHOUT PUNCTUATION MARKS? The answer is ‘yes’ with a huge caveat. The poet E.E. Cummings is well known as a grammar rebel that care not a little about rules of grammar, especially punctuation, and he successfully alters basic sentence structure. NOTE: he removed the capital letters and almost doesn’t use punctuation at all. It is rebellious and may not be accepted in some quarters, put to the test of grammar, it may fail woefully. But it still accomplishes a lot as a poem, earning accolades in his time.